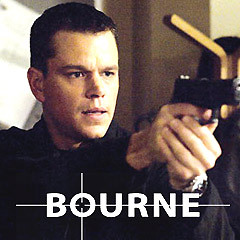 This third, action-packed adaptation began with Bourne continuing to be chased in Moscow (a continuation of the action scene from the end of the second film) following a tense car chase and being wounded by Russian assassin Kirill. He escaped from a medical clinic where he had been treated, telling two officers that he kept alive: "My argument is not with you." Six weeks later, UK London Guardian investigative newspaper reporter and "Security Correspondent" Simon Ross (Paddy Considine), asking "What connects the dots? ", wrote a well-informed feature article about CIA-trained amnesiac agent Jason Bourne (Matt Damon). Ross was tipped off in Turin, Italy by Madrid's CIA Station Chief Neal Daniels (Colin Stinton) about a top-secret, upgraded CIA umbrella program (of Treadstone) code-named Operation Blackbriar - of interest to Bourne - and to ruthless, "dirty," black-ops Deputy CIA Director Noah Vosen (David Strathairn) in New York and his serious colleague Pamela Landy (Joan Allen) who wanted to keep the information secret. Vosen was led to assume that Bourne was Ross' journalistic source. Bourne was forced to avoid various nefarious CIA forces that were targeting him for elimination throughout the entire film; it was a race against time, as Bourne, still considered a serious threat by the CIA, sought to meet Ross (in a brilliantly-choreographed surveillance sequence in London's cavernous Waterloo Station) and learn about his own origins and identity by retracing his steps ("Someone started all of this and I'm gonna find them"). However, Ross was under intense surveillance by the CIA as he took a taxi to the station, although Bourne cleverly instructed him how to avoid being tracked. Bourne learned from Ross that Blackbriar was a "Treadstone upgrade," and that Bourne was "square one, the dirty little secret." However, Ross was shot and killed by sniper fire from London "asset" or assassin Paz (Edgar Ramirez) in the midst of the busy Waterloo concourse. With Ross' hand-scribbled notes, Bourne learned the identity of Ross' source, Neal Daniels, and trailed him to his Madrid office location. Deputy CIA Director Pamela Landy (Joan Allen) was called upon to aid in the search effort for Bourne, to Vosen's consternation, and she also tracked down Ross' source. Bourne was the first to reach Madrid, however, where he found Daniels' emptied safe, although there was a single photograph on the floor of two individuals (later identified as Daniels and Dr. Hirsch) - causing him severe flashbacks (to the time of his early indoctrination and training period as a CIA operative). When Vosen's CIA team arrived at the office, Bourne fought them off, and teamed up with sympathetic operative-ally Nicolette "Nicky" Parsons (Julia Stiles) who unexpectedly just arrived. She had been reassigned and posted there in Madrid after Berlin, and helped Bourne further trail Daniels to Tangier, Morocco (300 miles away, where he had wired himself $100,000) while simultaneously helping him evade his old employer (she lied to Vosen about Bourne's whereabouts when he spoke to her on the phone). Vosen told Landy that Blackbriar started as a NEAT surveillance program, but now was "the umbrella program for all our black ops. Full envelope intrusion, rendition, experimental interrogration...We are the sharp end of the stick now, Pam. (Lethal action?) If we have to, sure. That's what makes us special. No more red tape. No more getting the bad guys caught in our sights, then watching them escape while we wait for someone in Washington to issue the order." In Tangier, Morocco, the CIA ordered Daniels assassinated by "asset" Desh Bouksani (Joey Ansah) coming from Casablanca, with Nicky and Bourne pursuing Daniels to question him about Bourne's own forgotten past (Bourne told Nicky: "Something happened to me, and I need to know what it was, or I'll never be free of this"). During the pursuit, Vosen discovered that Nicky had deceived Desh to help Bourne locate him, and judged that she had "compromised a covert operation" - Vosen ordered her exterminated as well ("We find Parsons, we find Bourne") - and prompted Landy to quit after telling him: "You do not have the authority to kill her...Noah, she's one of us. You start down this path, where does it end?" Bourne followed Desh on motorbike, but was unable to prevent Daniels from dying in his car next to Desh's remote planted bomb. Bourne was stunned by the blast, but was able to follow Desh as he pursued Nicky (and he himself was pursued by Tangier police who mistook him for the car bomber), in an exciting motorbike street chase and footrace sequence that went through courtyards, across rooftops, and into windows, ending with Bourne beating and strangling Desh to death. Bourne saved Nicky's life, and then told her to divert the pursuit - "code it in" that they were dead. Nicky left him when she boarded a bus to blend in and disappear, as Bourne told her: "It gets easier." The action then shifted to New York City where Bourne went to further clear his name at a CIA substation in the city, after finding its address in Daniels' charred papers at the Tangier morgue. He cleverly diverted Vosen from his NY office, having him trail Landy to falsely meet up with Bourne, while Bourne himself entered Vosen's empty office and stole top-secret Blackbriar papers from his high-security safe. Bourne confessed to Hirsch: "I remember everything. I'm no longer Jason Bourne," but did not kill Hirsch, explaining: "You don't deserve the star they'd give you on the wall at Langley." Bourne then found himself assaulted by CIA agents, including recovered assassin Paz on the CIA building's rooftop, who asked why he was spared earlier: "Why didn't you take a shot?" Bourne escaped being killed when he replied: "Do you even know why you're supposed to kill me?....Look at us. Look at what they make you give" - (words similar to what The Professor had told Bourne as he died in the first film). However, Vosen shot at him as he ran and jumped from the roof and fell 10 stories into the East River below, then floated motionless and appeared to be dead. Meanwhile, Landy exposed the entire Blackbriar program to the media and to Congress (revealing it as a criminal assassination program, after she had faxed the stolen documents from Vosen's office to the FBI, and told Vosen personally: "You better get yourself a good lawyer"). Her expose culminated in the arrests of its proponents, the two CIA officials Hirsch ("the alleged mastermind of the Blackbriar program") and Vosen ("the program's operational chief"), and top CIA boss Ezra Kramer (Scott Glenn) who underwent a US Senate hearing and criminal investigation, although Kramer denied involvement in authorizing the program (that may in some cases have even targeted US citizens). Nicky smiled as she watched an MSNBC breaking news report about Blackbriar's exposure and the multiple arrests, ending with the revelation (headlined "Former CIA Agent Missing") that former CIA agent David Webb's body "has yet to be found" three days since he fell into the East River - Webb's motionless body moved, and then swam away. This third film was the most critically-acclaimed, popular, and highest-grossing film of the original series. With three Academy Award nominations and wins: Best Editing, Best Sound, and Best Sound Editing. With the tagline: "Remember everything. Forgive nothing." With a production budget of $110 million, and gross revenue of $443 million (worldwide) and $227 million (domestically).